by online teachings on August 17, 2014 in Bodhicharyavatara, Teachings. You can soon download all the Bodhicharyavatara teaching audios through one page in the Library. Chapter 1 audio links are there already, and the rest of the chapters will be added shortly. Hopefully this makes accessing the teachings nice and easy! Our video server has been down for a while. It will soon be up and running again after a thorough maintenance. We apologise for the inconvenience, thank you for your patience, and hope you enjoy listening to the teachings on audio. As you know, it has been a busy, exciting and successful year for Rinpoche, with a lot of hard work organising His Holiness the Karmapa’s historical first visit to Europe in May-June, and now he is travelling again, without a steady internet access. Nevertheless, we hope that Rinpoche will very soon send us new teachings on the Bodhicharyavatara again. by online teachings on March 22, 2014 in Bodhicharyavatara, Teachings. Our sincere apologies for not posting any new updates on the Online Shedra during the past months. Now, this is to inform you that Ringu Tulku’s Bodhicharyavatara teachings will still be on hold for some time. As you may know, His Holiness the 17th Karmapa Orgyen Trinley Dorje’s first visit to Europe will take place in Germany in May-June. Rinpoche is in good health, and very busy, being the main organiser of His Holiness’ visit. We hope that many of you will be able to participate the upcoming events at Kamalashila and in Berlin. by online teachings on November 18, 2013 in Bodhicharyavatara, Teachings. For the past two months Ringu Tulku could not send new video teachings on the Sixth Chapter of the Bodhicharyavatara, and we have been missing his videos badly. In the meantime, the website has gone through some technical improvements, and the Online Shedra teachings were moved to a new platform. Re-linking of the videos is still under way and we apologize for the delay. However, now we are happy to present a series of videos from Rinpoche’s teaching on Patrul Rinpoche’s concise text on the Bodhicharyavatara. It is a wonderful recapitulation of the practice of a bodhisattva based on Shantideva’s book. The teaching will be published in several parts during the next weeks. It was given by Rinpoche in Vajradhara Ling, France, in August 2013. Warm thanks to the hosts and organisers of that event; and to Michéle for informing us about this teaching; and Lama Shenga for recording it on video, and everybody else who helped. And, of course, all gratitude to Rinpoche for sharing his knowledge and experience of the dharma to all of us with such kindness and care. by online teachings on October 13, 2013 in Bodhicharyavatara, Teachings. The Online Shedra videos are in the process of moving to a new server. We apologize for any inconvenience this may have been be causing you these past days. We expect all videos to be visible from the new server by next weekend. Until then, the number of videos that can be viewed will increase gradually. The audio teachings are available for listening during the move as usual. by online teachings on September 21, 2013 in Bodhicharyavatara, Teachings. After a successful summer tour Ringu Tulku is now again continuing the video teachings on the Bodhicharyavatara. 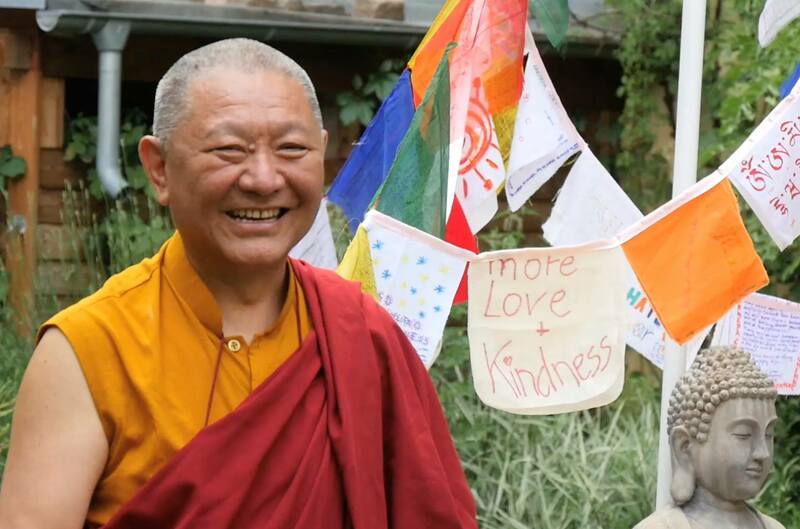 With this video (BA6_76-86) Rinpoche gives a commentary on the section of cultivating patience towards those who are doing something good for the people we regard as our enemies. This section is covered by stanzas 76 to 86 of the Sixth Chapter of the Bodhicharyavatara. To view the video, simply click on the image to view all the Chapter 6 videos. A transcript of this teaching can be downloaded here. The audio, the audio translations in different languages and the transcript of this teaching are available on Chapter 6 page. We are also studying the commentary transcript on Chapter 6, which you can download here and in the Library section. Further recommended reading: the commentary book by Kunzang Pelden (Khenpo Kunpal), The Nectar of Manjushri’s Speech, p. 216-219. You’re questions are most welcome. Please log in and leave your questions for Rinpoche as a comment below, or send them via email to studyquestions[at]bodhicharya.org. It is helpful if you can use one short paragraph and, if possible, less than 80 words. Any questions longer than that may have to be edited so please be concise. Questions will be collected from here on Friday, September 27, 2013, and included in Rinpoche’s answers video. After that date please send any questions relating to this video teaching via email to studyquestions[at]bodhicharya.org. by online teachings on August 14, 2013 in Bodhicharyavatara, Teachings. Many of us have been fortunate to meet Rinpoche in some of the events during his summer tour, but he has not been able to send new videos on the Bodhicharyavatara lately. by online teachings on July 25, 2013 in Bodhicharyavatara, Teachings. After the glorious Bodhicharya Summer Camp in Portugal, Rinpoche is continuing his summer tour, currently traveling in France. He’s not had the circumstances to send new videos on the Bodhicharyavatara so far, so why not enjoy this summer gap and maybe catch up with the previous online shedra teachings — or listen to the recordings of Rinpoche’s wonderful teachings generously shared by some of the centers he has visited on his tour recently. Photo courtesy of Ani Könchog Lhamo, 2013.
by online teachings on July 6, 2013 in Bodhicharyavatara, Teachings. With video BA6Q5 Ringu Tulku Rinpoche answers the questions submitted by students concerning stanzas 54 to 75 of Chapter 6 of the Bodhicharyavatara. To view the video, simply click on the image to view all the Chapter 6 videos. If you prefer listening to the teaching in audio, use the audio player below. The audio as well as the audio translations in different languages and the transcript of this teaching are all available on Chapter 6 page. If you would like to volunteer in making transcripts of Rinpoche’s shedra teachings, or in making audio translations to your own language, please email us at shedra[at]bodhicharya.org. BA6_67-75 Having Patience When Our Loved Ones Are Harmed. Part 2.
by online teachings on June 15, 2013 in Bodhicharyavatara, Teachings. With this video (BA6_67-75) Ringu Tulku explains how the negative actions are done out of ignorance. It’s up to us to end this spiral, which otherwise could go on for generations. If I react with patience and loving kindness instead of hatred, then, even if that requires some sacrifice now, it will prevent more problems in the long run, and contribute to happiness of everybody. At least, I have started a more positive way of life for myself. If I can do this, I should rejoice. That’s the true dharma practice. This is Rinpoche’s commentary on stanzas 67 to 75 of the Sixth Chapter of the Bodhicharyavatara. We are also studying the commentary transcript on Chapter 6, which you can download here and in the Library section. Further recommended reading: the commentary book by Kunzang Pelden (Khenpo Kunpal), The Nectar of Manjushri’s Speech, p. 214-216. You’re questions are most welcome. Please log in and leave your questions for Rinpoche as a comment below, or send them via email to studyquestions[at]bodhicharya.org. It is helpful if you can use one short paragraph and, if possible, less than 80 words. Any questions longer than that may have to be edited so please be concise. Questions will be collected from here on Friday, September 21, 2013, and included in Rinpoche’s answers video. After that date please send any questions relating to this video teaching via email to studyquestions[at]bodhicharya.org. by online teachings on June 8, 2013 in Bodhicharyavatara, Teachings. We are also studying the commentary transcript on Chapter 6, which you can download here and in the Library. Further recommended reading: the commentary book by Kunzang Pelden (Khenpo Kunpal), The Nectar of Manjushri’s Speech, p. 214. You’re questions are most welcome. Please log in and leave your questions for Rinpoche as a comment below, or send them via email to studyquestions[at]bodhicharya.org. It is helpful if you can use one short paragraph and, if possible, less than 80 words. Any questions longer than that may have to be edited so please be concise. 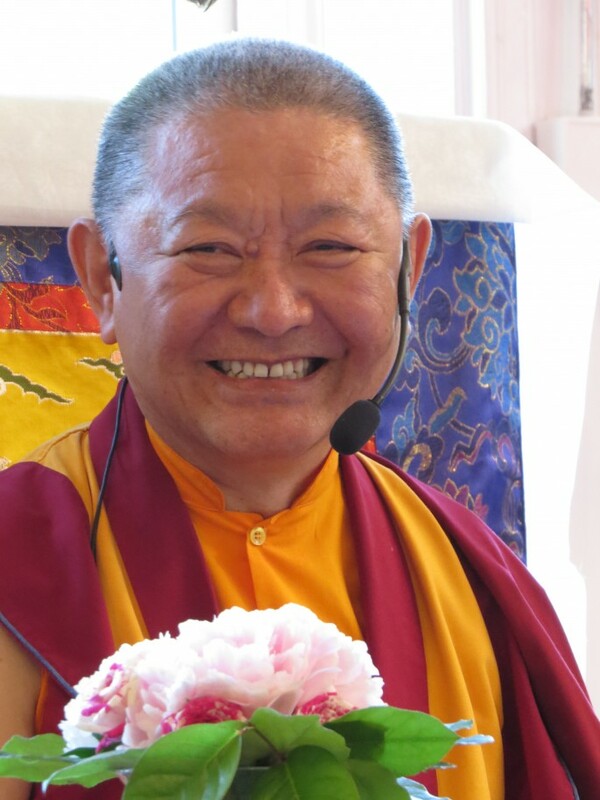 Questions will be collected from here on Friday, June 14, 2013, and included in Rinpoche’s answers video. After that date please send any questions relating to this video teaching via email to studyquestions[at]bodhicharya.org.